R. Greenspan & Co. were importers of willows and reeds and manufacturers of baskets here at 39 Ainslie St. from 1935 until the late 1970s. They were in business in Brooklyn from around 1904. They were located at 139 Stagg St. (1904-1906), 159 Meserole St. (1906-1914), 185 Graham Ave. (1915-1925), and 213 Graham Ave. (1926-1934) before moving to Ainslie St. (1935-1977). The founder was Reuben Greenspan (1874?-? ), an immigrant from Austria / Poland around 1893. His birth date is somewhat uncertain. Although two passport applications from the 1920s indicate that it was 22 Dec. 1874, his naturalization petition dated 3 Aug. 1904 gives a birth date of 15 Sep. 1874, while a passport application from 1912 says 15 Apr. 1874. Also, his World War I draft registration has 12 March 1873. The passport applications specify Rudnik, Poland, as his place of birth. Reuben Greenspan appeared in the four successive U. S. Census reports of 1910, 1920, 1930 and 1940. 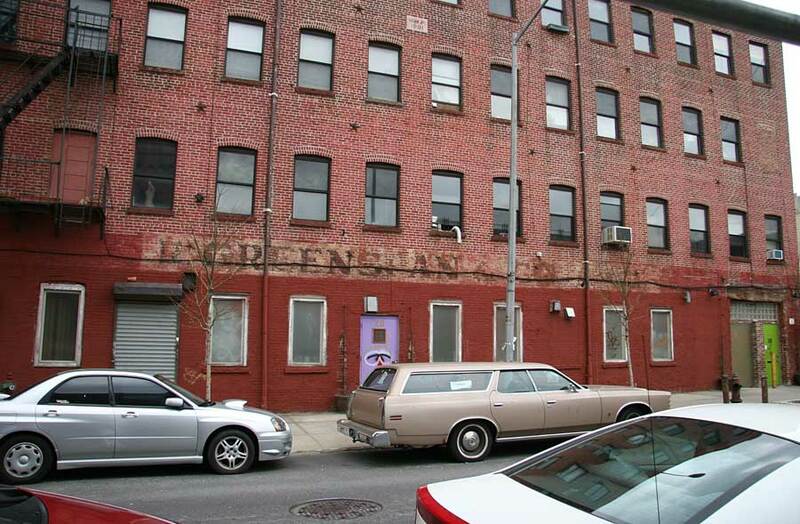 In 1910 he lived at 155 Meserole St., Brooklyn, when he was 34 years old and worked as a basket maker. In 1920 he lived at 185 Graham Ave., Brooklyn, and his occupation seems to be "Importer, Willow Stock." In 1930 he lived at 625 Montgomery St., Brooklyn, a "dealer, baskets." In 1940 he lived at 472 Empire Blvd., Brooklyn, and his occupation was "Real Estate Agent." This letter, signed by Reuben Greenspan, with the R. Greenspan letterhead, was attached to a passport application in 1920 when R. Greenspan was located at 185 Graham Ave. The same application had an attachment signed Adolph Simson, who had his own business importing willows and reeds. A later passport attachment dated 5 May 1921, signed Ruben Greenspan, declared, "I am an importer at the port of New York and have been for 15 years." Polk's 1933-34 Brooklyn City Directory lists Rubin Greenspan and Adolf Simson as officers at R. Greenspan & Co. Adolf Simson (1890-1957) was an immigrant from Riga, Latvia, who seems to have joined Greenspan around 1924. He registered for the World War II draft in 1942 when he was 51 years old and lived at 733 Lenox Road, Brooklyn. He gave his employment as "Self, Importing, 39 Ainslie St., B'klyn, N.Y."